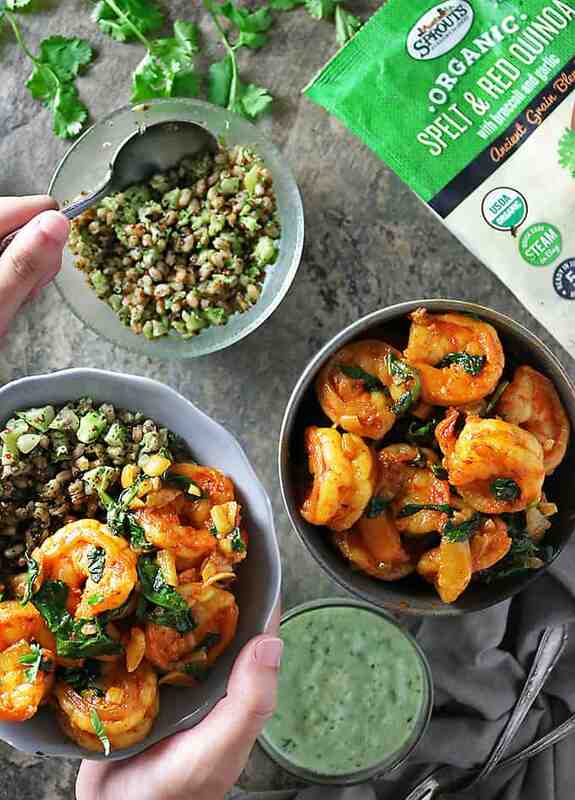 This Spicy Curried Shrimp Spinach Bowl with Sprouts Ancient Grains Blends makes for a quick, easy, delicious and better for ya meal, especially during those busy back to school nights! This Monday morning, kiddos in the largest school district in Metro Atlanta are back in school! All I do know is that before I know it, Christmas is going to be here! Most of my friends and old neighbors have school-aged kids and, over this summer, they have loved sharing stories about football and soccer practice and how they are so looking forward to starting back with their teams after summer break. And, most of their parents sigh when ruminating over dinner-time during those practice and game nights. And, I cannot help but interject that they need to stop by Sprouts Farmers Market for dinner-time help! Just grab one of the four new flavors of Sprouts Ancient Grain Blends, pair it with a salad and rotisserie from their deli and boom – dinner is ready! If you have a few more minutes to spare, then just pair one of those Sprouts Ancient Grain Blends with some curried Jumbo Shrimp (which are on sale at Sprouts, BTW) and spinach. 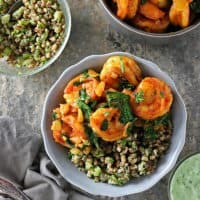 Serve it with a cool and refreshing cucumber sauce (like you see here in these Spicy Curried Shrimp Spinach Bowls) for a delicious and better for you dinner choice. While I was lost wandering the aisles at Sprouts, I ended up finding some Jumbo shrimp that were on sale and decided to bring them home to make into a curry. 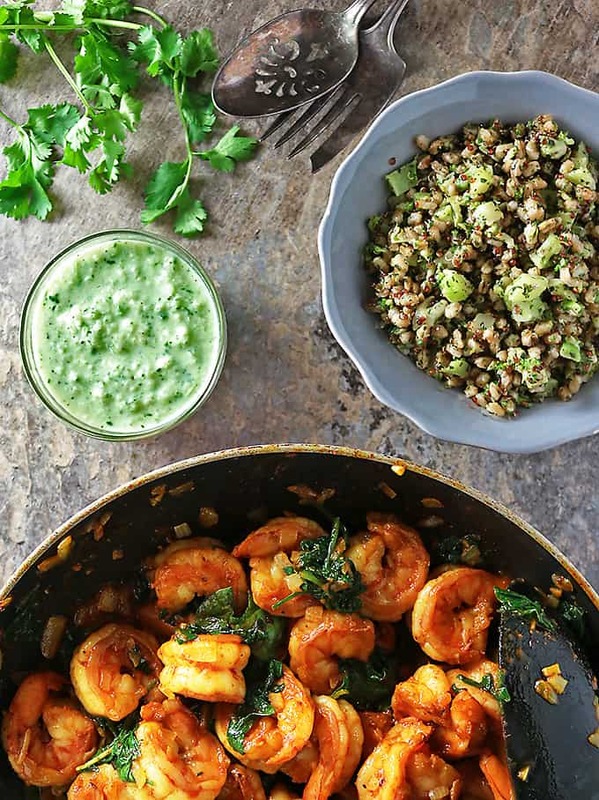 Only, when I spotted the new Sprouts Ancient Grains blends in their frozen department by the produce, I figured I’d grab some of those and some spinach and and make these Curried Shrimp Spinach Bowls instead. The cucumber sauce I made to accompany these Spicy Curried Shrimp Spinach Bowls was a last minute add on. But, it balanced out the spicy curried shrimp so well. 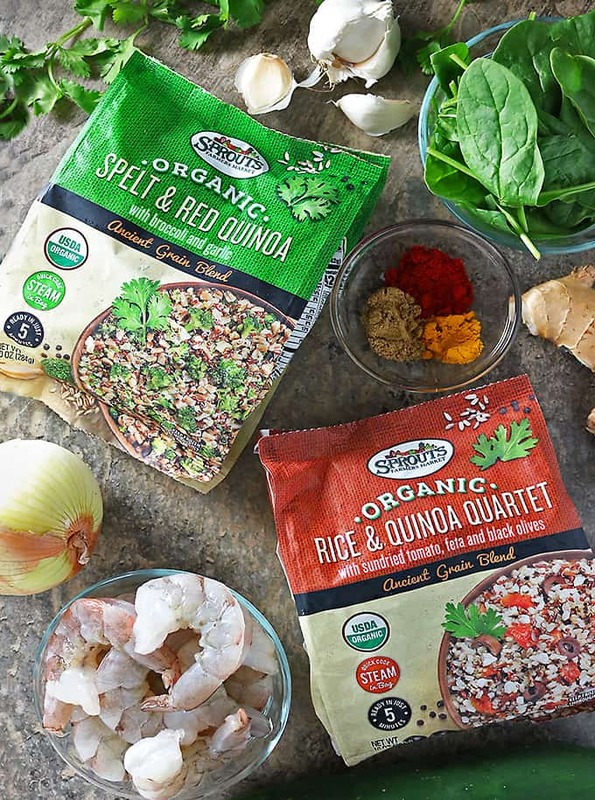 If you are fortunate enough to have a Sprouts near by, or, are in the range for delivery, please do check out their four new flavors of Ancient Grain Blends. 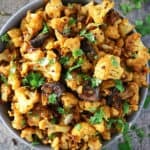 On those nights after school and practice sessions or a cramming session for a college class or a rough day at the office, they are perfect for a quick, easy, delicious and nutritious meal! 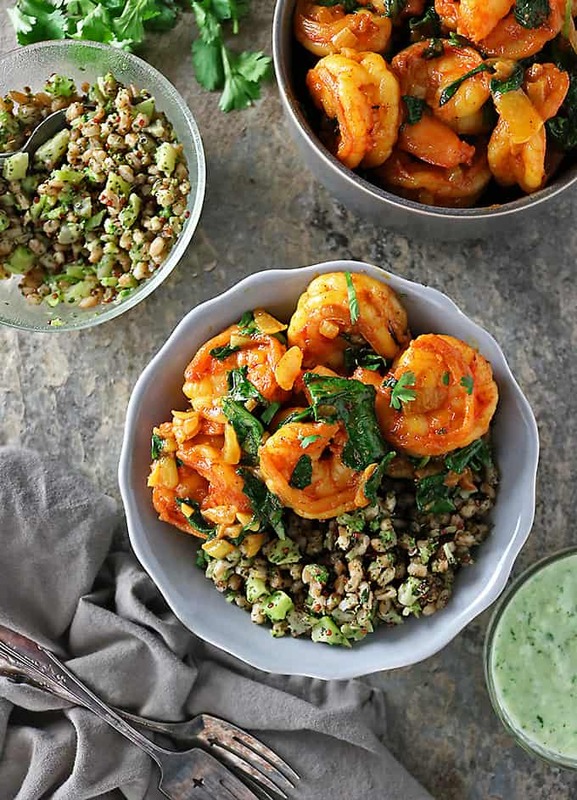 Shrimp and spinach that has been spiked with smoked paprika, chili powder, coriander and turmeric pairs so well with a refreshing cucumber yogurt sauce and Sprouts Ancient Grains Spelt and Red Quinoa Blend. Add oil to a pan and add in the chopped onion. Saute onion about 15 minutes and then add in the garlic and ginger and saute a couple of minutes. Add in the shrimp along with the smoked paprika, coriander, turmeric, chili powder and saute until shrimp is cooked. 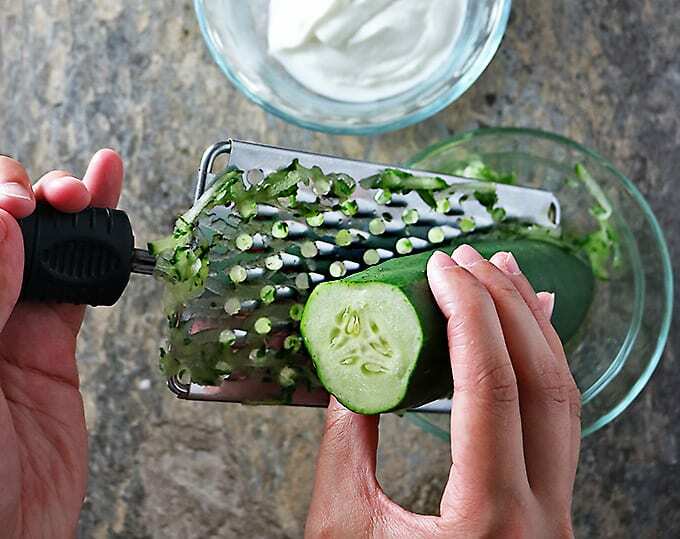 Add in the Greek yogurt and cilantro and mix well. Season with salt and pepper to taste and enjoy with Sprouts Ancient Grains Spelt and Red Quinoa Blend and with Curried Shrimp and Spinach. 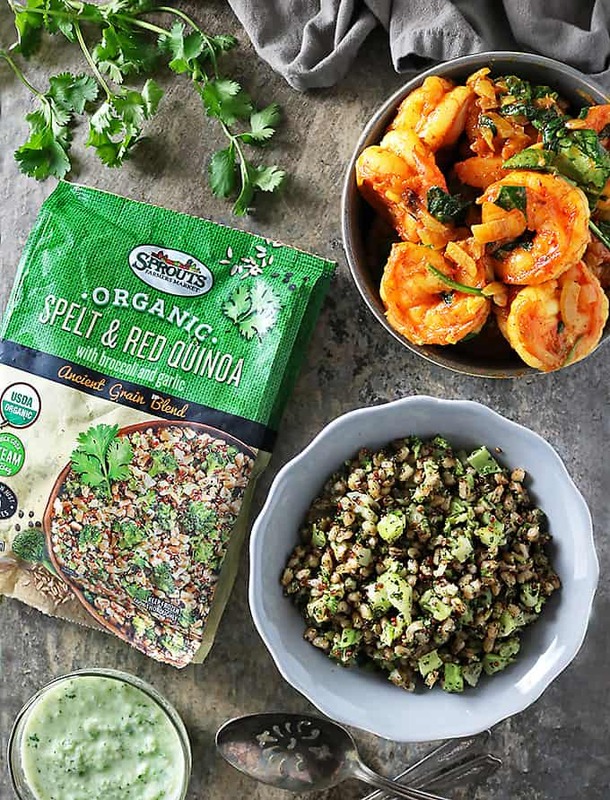 *Nutrition date is only for the Spicy Curried Shrimp Spinach Saute and cucumber sauce and does not include the Sprouts Ancient Grains - please check Sprouts Ancient Grains Blends Packaging for nutrition info. **Nutrition info is per Very Well Fit - please use your own calculations for accuracy. If you happen to fancy these Spicy Curried Shrimp Spinach Bowls, let me know what you think by leaving a comment and rating below. If you make this recipe, please post a pic on INSTAGRAM -tagging @savoryspin so I can see! 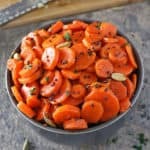 For more recipes and ramblings, like us on FACEBOOK and follow along on PINTEREST! This curry looks so flavorful and the cucumber yogurt sauce looks like the perfect way to cool down! Oh this looks like my kind of meal. I love shimp curry and even better when it’s got loads of spinach in it. Looks so yummy! The shrimp looks so succulent and delicious over the whole grain bowl. People are amazed that the kids are back in school here already. 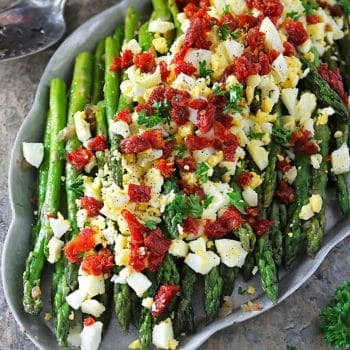 But what a quick and healthy meal for those busy nights to come! This looks so good! 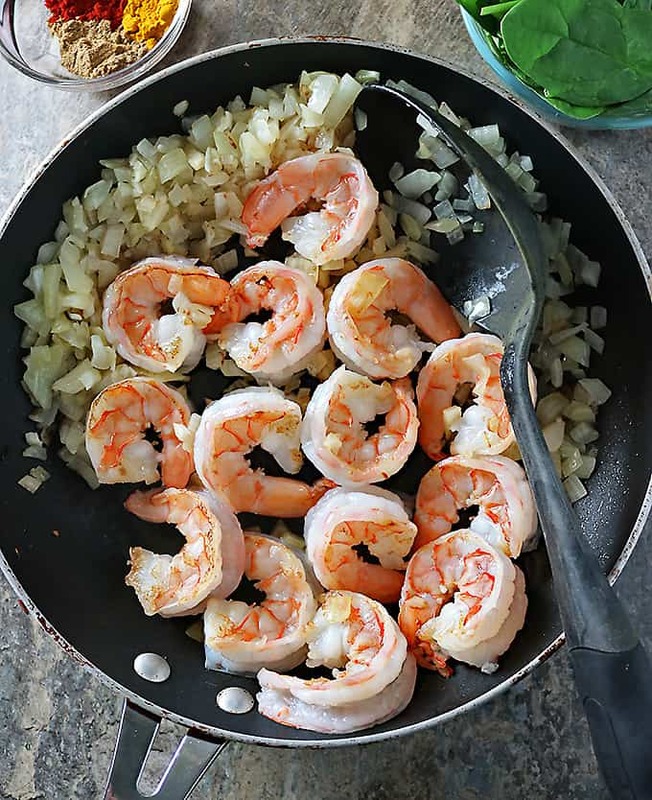 I love shrimp, and all those spices make me want to hop right into my kitchen! 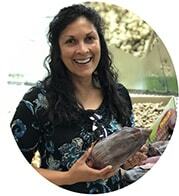 Hiya, I love the unique way, how you have combined these jumbo shrimps with this ancient grain mix. They are the perfect match in color and texture. Gorgeous! Oh man, I can see how you would get lost wandering in Sprouts! That store just sounds amazing. Next time you’re there, tell them to open one up in Clifton Park, NY, ok? 🙂 I’ve seen some of those back to school posts, too, and I’m like “huh?” The strange thing up here is that school starts much later…like after Labor Day. Kids still have another month to go of summer. But then again, the flip side is that school up here goes until mid-late June. We were always done by sometime in May. I don’t know if it’s related to the weather or what? Either way, this curry sounds like a delicious weeknight meal. And I love that you included a quick and easy raita in there, too! I’ll send you some zucchini if you return the favor with this dish? Haha…if only we could beam food back and forth! Those jumbo shrimp look absolutely delicious Shashi! 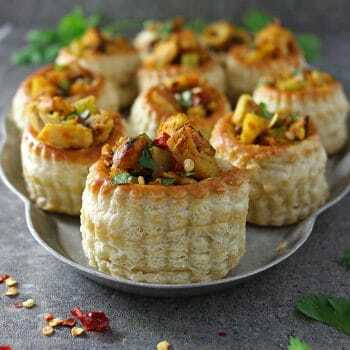 And that combination of spices to go with them. Wow! 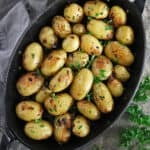 This is definitely a recipe I can see Lynne and I enjoying together on a Sunday evening when we have our weekly “Sunday Curry”. And I can see how the curried shrimp would go perfectly with the Sprounts Ancient Grains Spelt and Red Quinoa Blend. Thanks for this recipe. I am a sucker for shrimp. And this bowl right here is making me drool. So good!! Loving all these flavors. 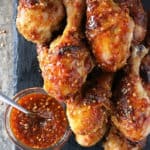 Need to make this recipe in my kitchen!